Canon EOS 40D on its way? 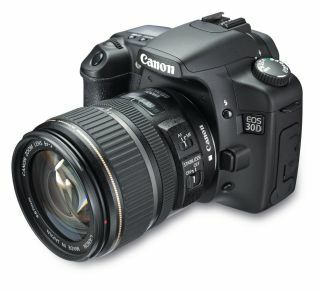 The Canon EOS 40D has been speculated about for a long time, and will be an upgrade to the Canon EOS 30D. Various websites are this morning reporting that the Canon EOS 40D release is imminent, after the camera was listed as PictBridge-certified on the Camera & Imaging Products Association (CIPA) website. However Canon has denied these rumours saying there was nothing to tell at this stage, with a spokesperson saying that the speculations on the next model "started the day we announced the Canon EOS 30D". The Canon EOS 40D digital SLR camera will reportedly have a 10.1-megapixel CMOS sensor measuring 22.5 x 15-mm, a 5fps burst mode, integrated anti-dust cleaning system, 2.5-inch LCD, and DIGIC II image processing, according to PhotographyBlog . The Canon EOS 40D has been talked about for over a year now, and would be an upgrade to the Canon EOS 30D , which has an 8.2-megapixel sensor.